Who doesn't love fresh fruits and vegetables? With rising food prices and concerns about GMO and non-GMO choices, it's refreshing to know that you can get locally-grown produce, meats, dairy, honey, and other items and support community efforts for healthy lifestyles. It's also a great way to help stimulate local economies and preserve small family farms. Many of the farmers markets featured here are members of the West Virginia Farmer's Market Nutrition Program and accept WIC and food stamps. You're sure to find what you're looking for at any of these best farmers markets in West Virginia. Started in 1992, the Barbour County Community Garden Market in Philippi, West Virginia, has experienced a steady growth because of its encouragement of healthy eating. They also accept WIC and food stamps and work with the community to provided nutritional information and support food growers in the area by allowing them to bring their surplus garden products to market. Sponsored by the United Methodist Church, additional services include a food pantry, home repair program, thrift store, and other programs that work with infants and children. What better way to get to know the local farmers and producers of fresh fruits and vegetables and other items like heirloom and hard-to-find products, fresh-cut flowers and locally grown honey. This farmers market is open from early April to mid-December, and offers a newsletter where recipes are featured that use the products sold there. You can shop, visit your neighbors, and get great deals on fresh products. Creating and maintaining a place for local vendors and customers to meet and support each other is the goal of Bridgeport Farmers Market in Bridgeport, West Virginia. Besides fresh fruits and vegetables, this market also encourages artists, musicians, authors, and chefs from around the state to share their knowledge and experience. The market also offers community events like a special holiday markets throughout the year and culinary events that bring in chefs who share their skills. Part of the WVU Extension Service, the Doddridge County Farmers Market in West Union, West Virginia, is the place to find fresh garden produce, chemical-free chicken, beef, and pork, organic eggs, and much more! Opening for the year in February, this local market has a Family Nutrition Program and provides knowledgeable resources to share tips about everything from soil testing to food safety to completing a Master Garden Program. Monroe Farm Market in Charleston, West Virginia, is a unique and diverse market comprised of over 30 farms in this area of the state. Besides fresh produce, visitors can purchase beef, veal, goat, chicken, lamb, pork, and dairy products every Thursday from May through October. They also offer a variety of fresh baked artisan goods like Persian sun bread, peanut butter pie, pepperoni rolls and many choices of gluten-free items. They even have pet food made by local growers from grass-fed beef and other natural ingredients. One of the few markets located in a downtown area, Pleasants Area Farmers Market in St. Marys, West Virginia, is open every Friday and Saturday from May through October with plenty of parking. In addition to locally-grown produce, visitors can find crafts, baked goods, maple syrup, bedding plants, and fresh flowers. Part of Soil Mate, an organization that promotes local food and beverages, the goal of this market is to teach about all aspects of health and how sustainability can be achieved in communities. Voted "America's Favorite Farmers Market" for two years in a row by the American Farmland Trust, Putnam Farmers Market in Hurricane, West Virginia, gives local farmers and artisans a chance to sell their produce and items to the community. Offering educational opportunities on topics like safe food handling, organic growing, and sustainable living, Putnam Farmers Market encourages support of local agriculture and is a member of Buy Fresh Buy Local West Virginia. What could be better than spending a Saturday morning in this small town (and West Virginia’s oldest) from late May through October choosing fresh fruits and vegetables from local farmers and cutting down on your food expenses? If that appeals to you, then visit Romney Farmers Market in Romney, West Virginia, where you can find a variety of chemical-free produce, herbs, and dairy products at great prices. There's even the opportunity to pick your own and save more. Operating from May of each year through mid-October, the Salem WV Farmers Market in Salem, West Virginia, is comprised of gives visitors a chance to select farm-fresh produce, healthy baked items, locally grown organic honey and eggs provided by family farms in the surrounding area. Located near the B&O railroad station, this farmers market has been in operation for 104 years. What a great place to find all your favorite locally grown food items, skincare products, flowers and herbs, and other special treats and support the small farms and crafters in the area. 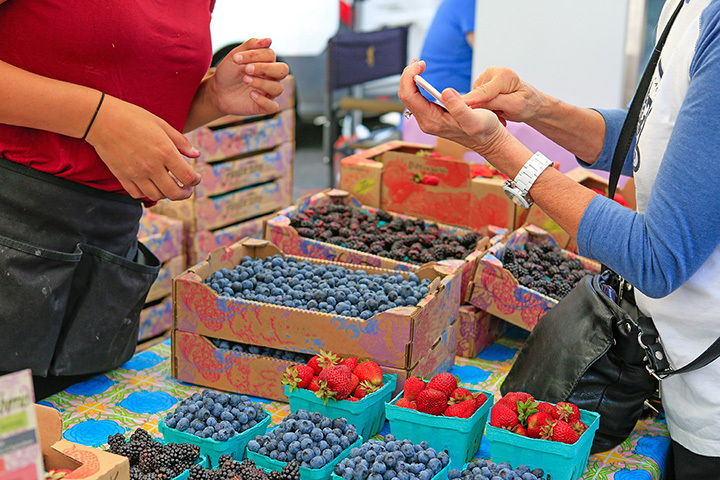 Open from April through December, Shepherdstown Farmers Market in Shepherdstown, West Virginia, gathers people together to share delicious food and provides opportunities to learn about organic gardening in one of the most historic areas of the state. View more West Virginia Farmers Markets.